As teachers, we’re always looking for ways to motivate students, to get some kind of positive emotional response from them. In MFL, we’re seeking ways to impart not just language, but something of culture too. We play our students songs. We tell stories of traditions and customs that seem very different to their own. Yet the demands of the timetable and the constraints of the curriculum sometimes prevent us from being able to introduce literary texts. This is where poetry can come in: bursts of culture, not huge novels and plays to plough through, but something shorter and genuine so there’s a real sense of achievement as they familiarise themselves with new language and rhythms. Poetry, whether ballads or sonnets, epic or lyric, is another, more melodic way of helping students explore new vocabulary, strengthen their understanding of grammar, learn idiomatic language and rehearse what they’ve learned in a way that seems just different enough. Poems are fantastic for vocabulary. Our students might not know what every word means, but they’ll have clues from the context to help them make educated guesses and hopefully, improve their success rate. They’re tools to help develop grammar awareness, even if it’s subliminal. Janice Bland develops Scott Thornbury’s work on "slow release grammar", suggesting "that the lexical patterns and grammatical categories acquired unanalysed by young learners – for example through poetry – may still be available to them as meaningful illustrative exemplars when they are introduced to pedagogical grammar rules in the secondary school". Reading poetry aloud helps improve intonation and the rhythm of speech, offering implicit instruction on form and meter. We’re triggering both sight and sound, giving students the opportunity to internalise the feel of the language. Each stanza lets them rehearse a particular sound; a drill, but perhaps not delivered in the usual way. Language devices like alliteration and assonance help learners target missing or unknown words more successfully. Imagine a traditional Haiku and how we might introduce it to students. It’s 17 on, split into a 5-7-5 three phrase structure raises student awareness of both word stress and stress timing. Learning poetry helps with memory too. Discussions around rote learning and recent debate concerning its perceived importance over other types of learning mean it can be viewed with some disdain in certain circles, but that’s not how we sell it to our students. They pick up song lyrics from repeated hearings. What’s the difference with poetry? It’s a good feeling to be able to join in with a song in its entirety. It’s this aspect of rote learning that we need to encourage; the joy in mastery. Equally important, teaching poetry gives us the opportunity to introduce a greater element of culture into the class than is ordinarily possible. For example, choosing a poem that references colour can mean very different things in different cultures. In many western countries, white suggests purity, morality and nobility, whereas red symbolises danger or passion. In China, red indicates luck, happiness and prosperity, whereas white is associated with weakness and a lack of vitality. Yet poetry also allows us to touch on the cross-curricular themes. It is universal, covering topics shared across culture: joy, despair, hope, jealousy etc. As Maley notes in Literature and the Learner: methodological approaches, poems represent a broader human experience, allowing students to understand them however they chose. Their ambiguity in meaning, if not in language, is a strength. So how do we introduce poetry to the classroom? 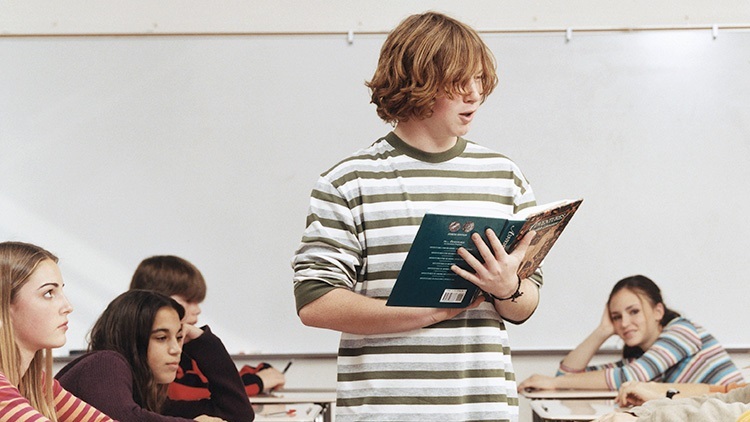 When students read a poem for the first time, we can focus not just on pronunciation, but rhythm, chanting perhaps, as a group, from one side of the room to the other. Students can act out the poem or sing it to a piece of music we put it to or a tune they create. Of course, we can simply translate it, but that’s not the direction for inspiration. We can ask students to interpret a poem through drawing, to show comprehension without words. We can ask them to adapt a poem, changing particular words to develop their skills in manipulating language. And what about poetry competitions? Adding a competitive element to proceedings, whether the focus is on the ability to memorise the poem, intonation or creation, can be highly motivating. Reading poetry provides students with opportunities to broaden their range of vocabulary, improve their pronunciation and delve deeper into another culture. They are intellectually stimulating, offering the chance not just to decipher new language and engage in the joy of rhythm, but to mould and manipulate, giving them rich opportunities to play, something we just don’t ordinarily have the time or space to encourage. There are a multitude of ways to engage with poetry in the MFL classroom, but it’s not just about what our students gain if we do give them that chance. If we don’t, we’re denying them another way of engaging with cultures beyond their own. Poetry is a relatively easy way to make sure we broaden the linguistic soundtrack we offer them.